Why is FFMI better than BMI? This FFMI calculator is dedicated to estimating Fat-Free Mass Index of your body. This method is more precise in comparison to the BMI (Body Mass Index) and overcomes its shortcomings when dealing with people who are well trained, as well as professional sportsmen. In the article below you can find an explanation of what is FFMI, the comparison of BMI vs FFMI, and the FFMI scale which allows you to classify your results. To perform a proper calculation, you need to know your body fat result in [%]. If you don't know it, use the body fat calculator to get this parameter. Also, if you are interested in more body fat measurements, check out our alternative calculation methods in the army body fat calculator and US navy body fat calculator. FFMI is the abbreviation of Fat-Free Mass Index. It describes the amount of your muscle mass in relation to height and weight. FFMI is part of the family of body indexes, together with well-known and similar BMI. Although the FFMI is less used, it is more precise than BMI, and also provides information about somebody's condition and health. Body fat - measured in percent units (use our body fat calculator to find your input value). Body Mass Index is a parameter calculated from your weight and height. The results are classified according to the defined norms, and thanks to that you can say whether your weight is ideal, normal or if you are overweight or even obese. However, this method has its limitations, the most significant being that it doesn't take into account the weight of your lean muscle mass, and your amount of body fat. Maybe, at first glance, it doesn't seem that big a problem, but the critics of BMI are justified. For example, two people with different heights and weights can have the same BMI, even though they have different amounts of both fat and muscle. Somebody with a lot of muscle mass can be classified negatively - as overweight or even obese. The BMI method is based only on weight, and therefore it doesn't take into account the difference in tissues and body type. From another point of view, an inactive person, someone who does not exercise and is in an overall unhealthy state, might get a very good BMI result. When somebody gains weight, and it is caused by fat tissue increase, that means the person has become less healthy. When an athlete (or fitness enthusiast) put on weight because of an increase in muscle mass, it is a good thing. Both situations mean the same from BMI's viewpoint - weight increase results in BMI index increase. That is where the Fat-Free Mass Index comes in with a solution. FFMI is defined in a way that allows distinguishing between fat gain and muscle gain. If the mass of fat increases, FFMI index goes down, and if the mass of muscle increases, FFMI rises. It is this difference that allows FFMI to correctly estimate somebody's body and health condition. On the other hand, Body Mass index (BMI) is a general estimation of your health that works well for most of the population. Note, that for somebody who exercises daily or trains professionally, BMI is mostly useless. For that kind of person, with more muscle mass than the ordinary people, Fat-Free Mass Index is a much better, much more effective choice. The following table indicates the classification of FFMI indexes. scores of FFMI between 28-30 are highly unlikely to be achieved naturally without steroid usage. 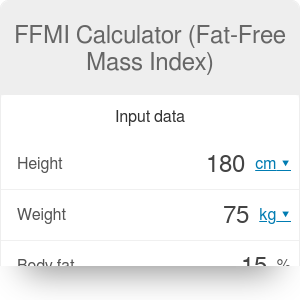 The FFMI calculator uses currently approved mathematical formulas for computing the fat-free mass, FFMI as well as Normalized FFMI . The latter is dedicated for taller athletes who are bigger overall. Body fat calculation bases on the simply equation: body fat = weight [kg] * (body fat [%] / 100). It is expressed in kilograms units [kg]. Fat free mass is estimated using the following method: fat free mass = weight [kg] * (1 - (body fat [%]/ 100)). Result is also expressed in kilograms [kg]. FFMI is calculated respectively: FFMI = fat free mass [kg]/ (height [m])². Expressed in kilograms per square meter [kg/m²]. For Normalized FFMI use the equation: normalized FFMI = FFMI [kg/m²] + 6.1 * (1.8 - height [m]). The same unit as in FFMI [kg/m²]. Fat-Free Mass Index calculator allows you to change the units which are displayed. You can switch between cm, m, kg, lb, etc., accordingly to your needs and preferences. Enter his body fat: 22%. The FFMI is 18.1 kg/m² - that number classifies our man to the average result - the message with the classification range is displayed automatically below the calculator. Normalized FFMI is equal to 18.1 kg/m² - it is identical to the non-normalized value because the man is not taller than the mean value of the population. His total body fat weighs: 16.5 kg. FFMI Calculator (Fat-Free Mass Index) can be embedded on your website to enrich the content you wrote and make it easier for your visitors to understand your message.